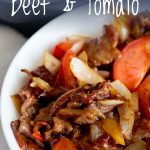 Restaurant style Cantonese beef and tomato stir fry is so easy to make at home and tastes better than takeout. 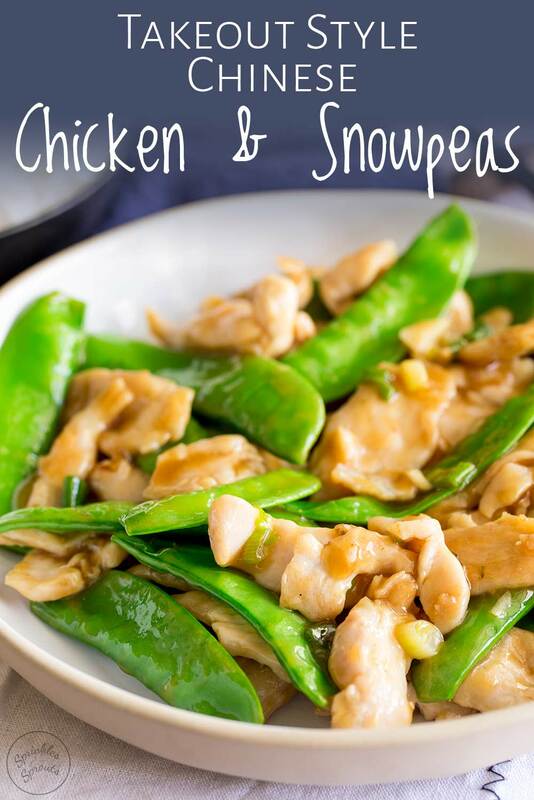 This delicious Chinese recipe is healthy and quick to make. Plus the sauce is delicious over rice or make it even more healthy and serve with stir fried veggies. This is one of my Dad’s favorite takeaway dishes so making it at home and gluten free is a big plus in our house! I know a lot of people have said to me that they just can’t recreate takeout food at home. That the meat ends up tough and the sauce is always missing the special something. Well today I am going to give you a FOOLPROOF way to have super tender beef at home. Plus we will take about getting that authentic takeout flavor! 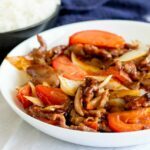 Have you ever bought the packets of beef strips for stir fry only to have your beef end up tough? It is because those packets don’t use the expensive cuts of beef. It makes sense they won’t sell beef fillet for the price of chuck. BUT there is a quick and cheap solution that will give you tender beef strips! The answer is baking soda! (Also called Bicarb, Bicarbonate of Soda and Sodium Bicarbonate) it will break down the fibres in the meat and leave it so tender. SERIOUSLY WE ARE TALKING THE MOST TENDER BEEF STRIPS YOU HAVE EVER EATEN! Sprinkle just a small amount of baking soda over the beef and then stir to coat. This will work for the packets of stir fry beef or for any cut of beef you want to buy. So which cut should I buy for beef stir fry? 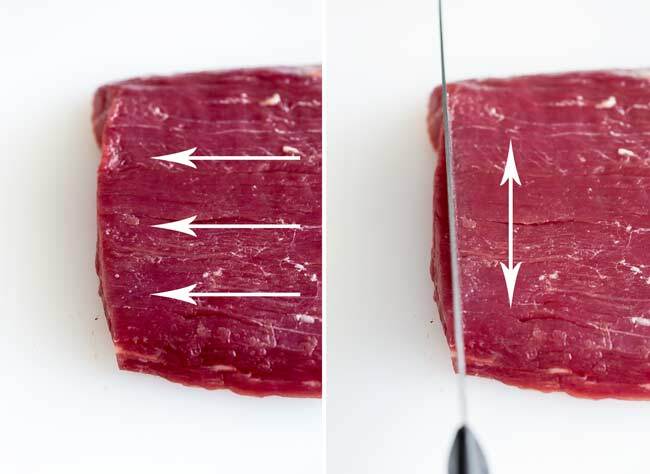 Using the baking soda trick you don’t need to lay out for beef fillet, you can use the more economical cuts and still have melt in the mouth tender beef. If you have bought a whole steak then how you cut the meat can have a big impact on how tender it is! The trick to super tender beef is to find the way the grain of the meat runs and then cut across the grain. This allows the meat to just fall apart in your mouth. Have a look at the picture below for an easy visual, in the first picture you can see the lines running along the meat. This is the grain of the meat. And you want to cut across this as shown in the second photo. The key to getting that great takeout style flavor is to use the right ingredients. 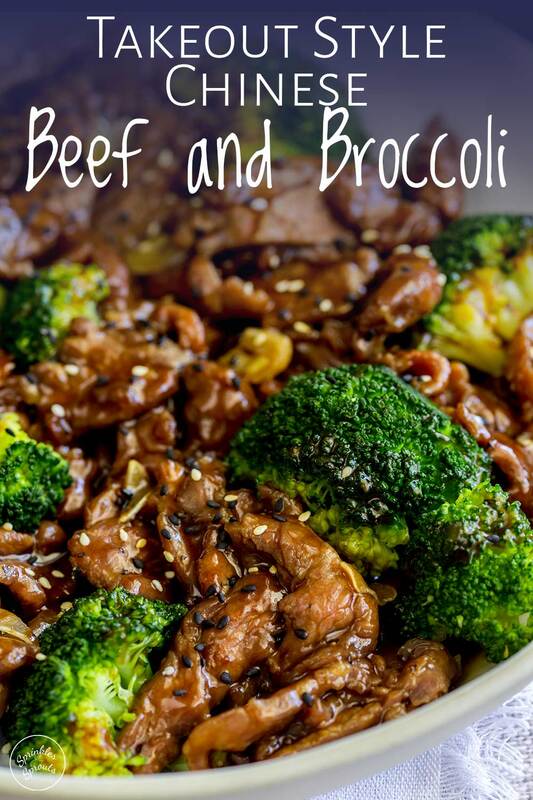 In some dishes like my Beef and Broccoli that includes a couple of different easily available sauces. 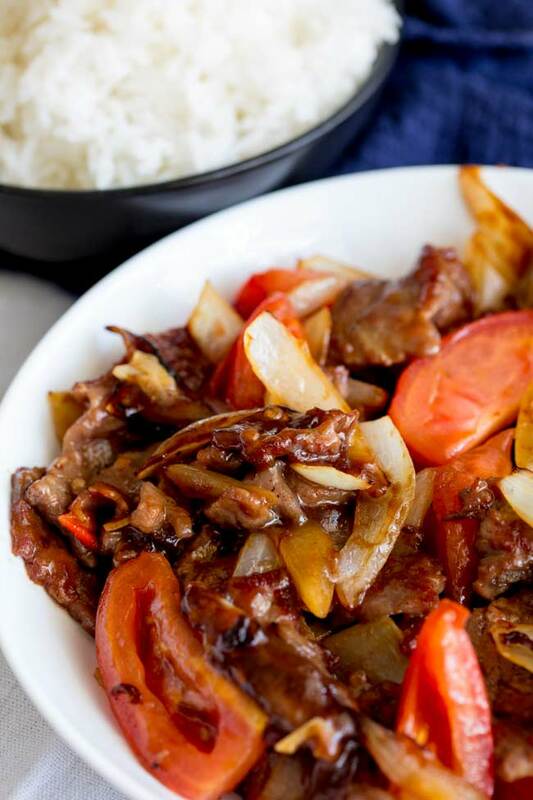 But this Takeout Style Cantonese Beef and Tomato really only uses one ingredient that might not usually be in your pantry. That is Chinese Rice Wine, also known as Chinese Cooking Wine or Chinese Shaoxing Wine. You can buy it in the grocery store, it will be in the Asian section. BUT if you really can’t find it then dry sherry is a great substitute. Don’t confused Chinese Rice Wine with rice wine vinegar…. your stir fry will be gross if that happens! Which tomatoes should I use? The recipe specifies fresh tomatoes unfortunately canned tomatoes don’t work here. You can use any fresh tomato, but I recommend either standard tomatoes or roma tomatoes. Beefsteak tomatoes tend to be on the large size and don’t soften fully, whilst cherry tomatoes area little small and turn easily to mush. 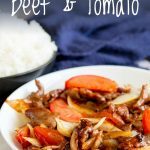 Serve this delicious Takeout Style Cantonese Beef and Tomato with rice for a takeout style dinner. Or for those cutting back on the carbs it is equally delicious with cauliflower rice. Alternatively add a bowl of noddles on the side! 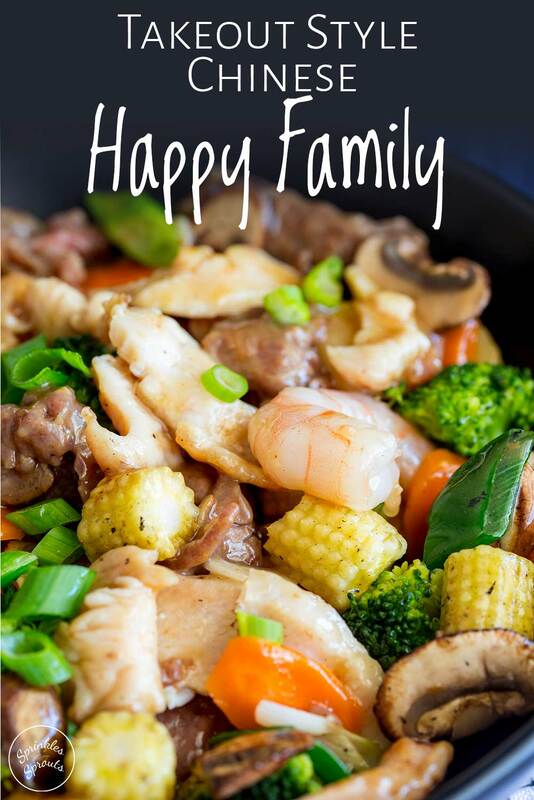 Find out why a frying pan is the perfect pan for cooking your stir fry in. Prepare your onion, garlic and tomato before you start cooking. Chinese stir frying is quick cooking so you need everything prepped and ready. Mix the sauce ingredients together before you start cooking, but ensure you whisk it well before you add it to the pan. Don’t let the beef or tomatoes cook for too long, you want everything to be crisp and just cooked. For a truely authentic flavor grab a bottle of in Chinese rice wine also known as Chinese Cooking Wine or Chinese Shaoxing Wine. You can find it in the Asian section of the grocery store or online. It will make ALL the difference. 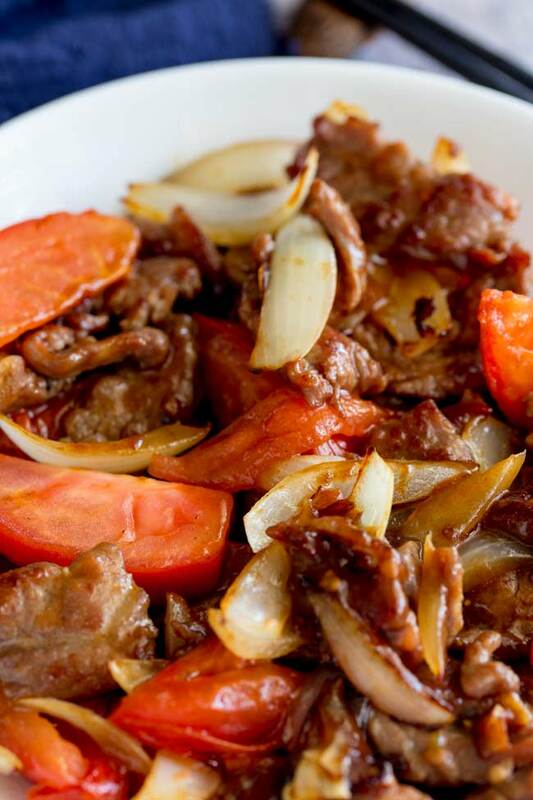 Why not pin this recipe for Takeout Style Cantonese Beef and Tomato. Pin it here. If using beef steaks, slice beef the beef across the grain, into 1/4″ / 0.5cm thick strips (see bulk of post for detailed pictures). 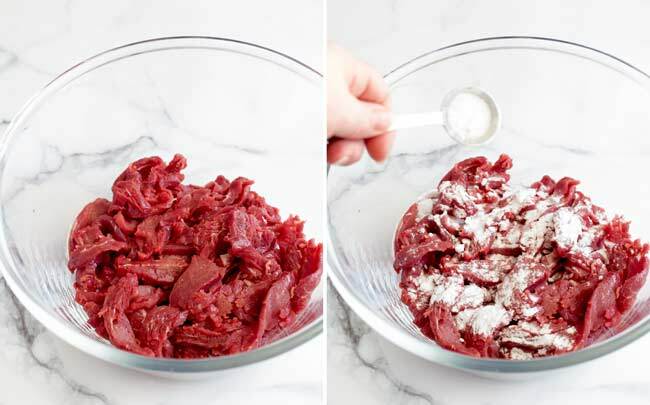 Place the beef strips in a non-metallic bowl and sprinkle with baking soda and gently mix so all the beef is fully coated. Peel the onion and cut into thick wedges. Cut each tomato into 6 wedges. Mix the corn starch, Worcestershire sauce, soy sauce, and Chinese rice wine together in a small measuring cup. Set aside. Place a heavy based fry pan or wok over high heat. Once hot add the 1 tablespoon of oil to it and swirl gently. Add the beef and cook quickly for 2 minutes. Remove the beef from the pan and set to one side. Add the remaining oil to the pan and stir fry the onion until just starting to color. Add the garlic and tomatoes and cook for 2 minutes. Give the sauce a stir and then add it to the pan along with the cooked beef. Stir well and cook for a further minute until the sauce thickens. Baking soda is also called Bicarb, Bicarbonate of Soda and Sodium Bicarbonate, it will break down the fibres in the meat and leave it so tender. You can use any fresh tomato, but I recommend either standard tomatoes, plum tomatoes or roma tomatoes. Beefsteak tomatoes tend to be on the large size and don’t soften fully, whilst cherry tomatoes area little small and turn easily to mush. Chinese Rice Wine, also known as Chinese Cooking Wine or Chinese Shaoxing Wine. You can buy it in the grocery store, it will be in the Asian section. If you can’t find it then dry sherry is a great substitute. Don’t confused Chinese Rice Wine with rice wine vinegar…. your stir fry will be gross if that happens! Ensure you dry the beef really well so it stir fries rather that sweats when you cook it. 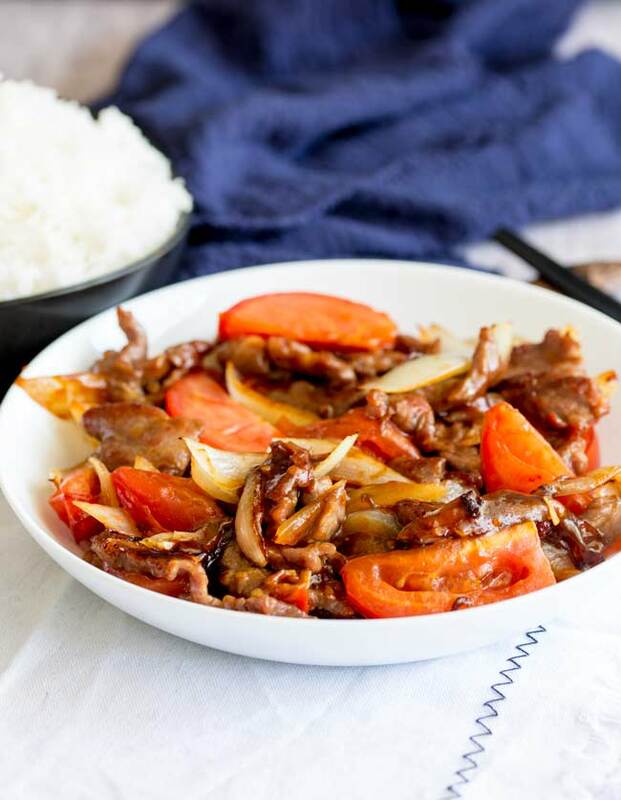 If you love food why not subscribe to my newsletter, I will drop you an email every now and then, just to say hi and send you a couple of recipes I think you might love, like these Takeout Style Cantonese Beef and Tomato. I know you’ll love it, the beef is so tender!!! !